Yes, another long book review (>6100 words), but this book is loaded with data worthy of an in-depth review. 7: Fighting Global Warming with … Bubbles? 13: Is the Answer Blowing in the Wind? 33: Do Humans have a Destiny in Space? Bill Nye is no climate change denier. He knows enough of the science to know climate change is a real threat to life on Earth and it must be addressed now. He points out that everyone wants what we have in our country: cars, planes, readily available electricity, more electronic devices, more more more. I’ve heard climate change deniers state that “God wouldn’t let humans change or damage the world he created.” Poppycock! I always counter with “Did you ever hear about nukes? We have far more than needed to change our climate and wipe out all life – God didn’t prevent them.” Bill points out that another species – cyanobacteria – once changed our climate by producing oxygen, which in turn killed off life that couldn’t tolerate oxygen. We humans aren’t the first to affect our climate, although we can hope we will change it back for the better while we can. When I was young, our total population was 3 billion, and scientists wondered if we could handle feeding 6 or 7 billion people. We are over 7 billion now, and we do feed them, but now our concern is how adding so many new users of fossil fuels adds to climate change. And as more people are born, that means more fossil fuel users are adding to the carbon dioxide contribution in our atmosphere, and carbon dioxide levels directly impact the temperature of our planet. The first sentiment is a head-in-the-sand view on global warming, and the second is a misunderstanding that the Earth will be destroyed if we do nothing to save it. Both are wrong. We need to act now to counter the effects of global warming, and we need to understand that the effects of global warming could make Earth uninhabitable for humans. For decades, politicians and special interests (the Tobacco industry) denied cancer and smoking were linked, and the approaches they used for denying the smoking-cancer link are being used for climate change denial. Too many people that believed the politicians and cancer deniers died, trusting those people over scientists. Are you willing to let your children and grandchildren go through that same experience? The difference between climate change denial and smoking-cancer link denial, is that everyone on Earth is affected by climate change – you can’t stay away from second hand climate change the way you could stay away from second hand smoke. And, unlike smoking, you can’t quit climate change denial. We have to reverse the buildup of carbon dioxide in the atmosphere. The author points out that, to address climate change, we will need to come up with solutions for energy to replace fossil fuels, better ways to transmit electricity, and better ways to store electricity. We also need to be able to convert seawater to drinkable water, grow more food and transport it using power sources other than fossil fuels. That is one of the easiest explanations why carbon dioxide is directly involved in global warming. The author goes on to explain that the extra heat trapped by increasing levels of carbon dioxide alters weather patterns and local climates around the world. It’s amazing that climate change, which has scientific consensus for 30 years, is still contested by climate change deniers. It is disappointing that the media allows climate change deniers to quote an article in Newsweek published in 1975, that suggests we were heading for a new ice age, not warming. Newsweek is not a science magazine, and we know a lot more about climate science than they did in 1975, yet this is rarely called out by the media when they let deniers state that as evidence scientists don’t know enough about climate to predict changes. The media should stop giving deniers, especially those without education climate science, equal footing with climate change scientists. And a little more fact checking would dispel these old claims that have long been disproven but are still raised by deniers. This happened in February 2015, where Sen. James Inhofe brought a snowball to the senate floor and declared it proved global warming was a hoax, because it snowed somewhere. Funny, and quite wrong. This senator doesn’t understand climate change. And the argument that more carbon dioxide is good for plants is wrong, as it ignores that more carbon dioxide in the atmosphere means more retained heat for our planet – not good, as that means some areas of the planet will become too warm or dry for plants to thrive. Another concern climate scientists have concerns methane, as it has much more effect on global warming than carbon dioxide. Methane is trapped in ice, and will be released as more arctic/antarctic ice melts. Attacks on climate scientists, on the data used, on gases on that cause global warming, and on climate change models serves one thing: to delay a response to global warming. The author lists costal cities that will be impacted by rising seas, and it’s not good. New Orleans, Miami, San Francisco, San Diego, Los Angeles, New York, Tokyo, Sydney, Venice, Mumbai and Qingdao will need major infrastructure changes to prevent being rendered useless. And these cities will be affected all too soon, as sea surges during storms will impact them long before the sea is thigh for the existing banks and dams. And don’t forget countries like the Netherlands that already have sea level issues. If people need to move inland to get away from the water, where will they go? Transportation to new homes, food and water and clothing, as well as new equipment for jobs, updating existing infrastructures to accommodate new settlers, and creating new sea ports will cost a lot. And don’t forget, that land can be used for housing, work and food production – if more land is needed for housing, we will lose land that could generate food supplies. And rising seas will result in flooding, which means water-born diseases and mosquito-born diseases, which will cost lives and time and money to address. And parasites normally unable to handle cold weather will flourish in new warmer climates. If we do nothing, the costs to address these problems will be overwhelming. That’s a lot of gas that retains heat. In 2014, our atmosphere topped 400 parts per million for the first time in history. The author points out that the amount of carbon dioxide in our atmosphere isn’t the problem: the rate of change is. The rate that carbon dioxide is being added to the atmosphere is accelerating because there are more of us each day. More people means more need for power and food and transportation, meaning more carbon dioxide. Bill describes a feedback loop in climate science: adding heat increases water evaporation. Warmer air holds more moisture than cooler air, so as air warms up, more moisture is evaporated. And water vapor traps heat too, so this addition of water vapor to the air demonstrates a positive feedback in climate science. When water reaches a certain altitude, clouds form, and clouds reflect sunlight into space, causing the Earth to get less sunlight and less heat. This effect of reflecting heat by clouds is negative feedback. But that isn’t all. Clouds low in the atmosphere reflect heat, but clouds high in the air actually reflect heat back down to the Earth, so high altitude clouds have a positive feedback. Another example of feedback is arctic ice. When arctic ice exists, it reflects sunlight, which is negative feedback. When arctic ice melts, the darker seas absorbs more sunlight and heat, which is a positive feedback. And warmer seas mean more ice melts, so even more positive feedback. Not good. And warmer seas means disruption in sea currents, causing changes in air and ice and sea elsewhere, causing an even bigger positive feedback. This chapter highlights one of the limits affecting the fight against global warming. Heat released as inefficient use of motion energy. There is only so far we can go to improve efficiency. Fascinating read and the one I’ve enjoyed most, so far. This chapter deals with geoengineering, a proposed way to address global warming. The author explains that clouds and arctic/antarctic snow and water allow Earth to reflect around 30% of the solar energy that us, so we retain 70%. As we get warmer, there is less ice to reflect solar energy and so Earth gets hotter – not good. One proposal to reduce the amount of solar energy the Earth retains is to inject bubbles into water. That works because bubbles are more reflective that calm water, and so the water with bubbles would reflect more solar energy. Another benefit of adding bubbles is that it reduces the amount of water lost to evaporation – very important in a world with dwindling natural resources like potable water. The author points out that, while this isn’t currently done intentionally, it could be worth the effort very soon. If injecting bubbles could be done economically, and on a wide enough scale, it could reduce the solar energy we retain and help fight global warming. Other things that could help geoengineer Earth include adding more trees and more green growing things in the seas, as well as genetically engineer food sources to be lighter in color. This chapter shows we as a society have dependence on electricity, and that we need to reduce the carbon used to generate that electricity. Coal generates power, but with a huge carbon footprint. so cleaner burning natural gas could be a temporary bridge to newer ways to generate electricity. 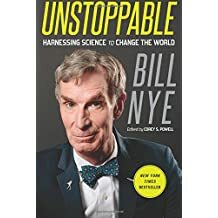 Bill Nye points out that natural gas is, at best, a temporary solution and we need to leave it underground, due to release of methane into the atmosphere. Methane is even more of a heat trap than carbon dioxide, and methane can leak into the air when fracking to extract natural gas. The author explains how fracking has evolved over time, from vertical to horizontal fracking. Some states ban fracking, while other states like Oklahoma embrace fracking. The thing is, Oklahoma started experiencing earthquakes after extensive fracking, and now sees earthquakes at level 5 of the Richter scale where none were experienced in the pre-fracking days. Cities and buildings have been damaged enough to warrant evacuation, and the lessons learned in Oklahoma should be recognized by other states using fracking for natural gas extraction. Tar sands, like those proposed to be carried by the Canadian Keystone pipeline, are far more dangerous to our environment. That is why I was surprised one of President Trump’s first acts as president was to approve the pipeline previously rejected by President Obama. As of July 2017, the Canadian company wanting the Keystone pipeline is reconsidering the need for it. Hopefully Canada will be more environment-friendly than our current Trump administration. With the Trump administration’s anti-environment, pro-fossil fuel stance, Trump’s EPA director has been rolling back or refusing to implement regulations designed to protect the environment passed during President Obama’s term. What should scare reasonable people, is EPA head Scott Pruitt’s decision to ignore regulations to control methane pollution (http://tinyurl.com/y9nvsbdc). The courts have recognized the validity of these regulations established during President Obama’s administration and have sided with our world against the Trump administration, but one has to wonder why Trump’s administration is so bent on harming our planet. If you die from pollution, how much good does it do to have more money? Chapter 10 focuses on nuclear energy – cleaner power plants than coal/gas fired plants, but with their own risks. The author explains how nuclear energy produces power, but isn’t sold on it as a bridge technology from fossil fuels to a clean power system. The author gives a simple and clear explanation on the fundamentals of nuclear power plants and the risks they pose. Bill suggests a reactor with thorium may be safer than uranium or plutonium, and he discusses fusion, which has been discussed but not possible for forty years. Fusion would be clean and cheap, but not something we can handle right now. Chapter 12 covers solar power: how it works, how efficient it is, and why it is a good carbon-free source of energy. We need better and less expensive solar panels on more homes, and that should happen over time. Bill points out that solar panels used in space are 40% efficient, whereas the ones homeowners can afford are around 15% efficient. Unfortunately, the US only produces about .4% of its power by solar energy and we need to make a lot more to replace coal-powered electricity to make a dent in our climbing carbon dioxide levels. When I was young, people talked about having solar panels in space to gather energy and send it to Earth. Bill points out the difficulties with that approach and shows how individual power systems for buildings or a city would be more feasible. Wind power. Clean energy and the US currently produces ~4.5% of its electricity from the wind. I’ve seen the wind farms in Iowa, many large windmills I’ve never seen stopped whenever I pass nearby. We could have more, and our previous administration encouraged wind power development over coal (a favorite of our current administration). The author makes a great point about the feasibility of wind power replacing coal powered electricity. Costs for wind power have dropped to 2.1 cents per kWh (kilowatt hour), whereas coal-powered electricity costs 1.2 cents per kWh, so the cost increase for wind powered electricity is not unmanageable. Bill describes how some hobbyists have rigged a propellor on the top of a boat to catch the wind, and linked it to a propellor under water to drive the boat through the sea. He says that this type of sail boat can drive straight into the wind (something anyone that ever sailed on a traditional sail boat will tell you is impossible). I’ve never seen these myself, but they sound really interesting. Unlike solar power, wind power typically isn’t reliable during the middle of the day, when electrical energy needs are highest. And the wind does stop, and wind isn’t available everywhere, but the low cost and no carbon footprint of it make wind power a valid candidate to replace much of our coal-based electricity in the US. Getting power from where it is generated to where it is used isn’t free nor simple. There are limitations to the efficiency of power being transferred. This chapter explains the details why there is power lost during transmission, so you understand why we need to get more efficient to reduce losses (and, in turn, reduce how much electricity we need to generate). Chapter 15 covers the power grid – how we distribute power from different sources like hydroelectric dams, to cities and homes. The important items for discussion here are magnetism and electricity: two of my fav topics. Bill says that increasing efficiency and reduces losses by electrical devices will reduce our need for electrical power. He also explains how transformers work, stepping up and down voltage as needed. But don’t let that cause you to skip this chapter. Bill gets into power transmission issues, buckminsterfullerene and nanotubes of carbon atoms. Nanotubes made of carbon atoms would provide almost no power loss of electricity over long distances, but we can’t make them very long now (50 nm max) – Bill points out that solving this problem would be huge and would change the world. Chapter 16 covers electric-powered cars. In 2007 I worked with a guy that had an electric car and he was proud of it. Unfortunately, he had a short drive (under 20 miles each way) and had to charge his car once he arrived at work and again when he arrived home. It may have been quite, but he told me the cost to replace the batteries would be more than buying a new car. Newer cars do much better these days, and the author is right that we should do more to move to electric cars. This chapter covers the many many different types of power storage containers (batteries) we’ve used in the past and present. Interesting material, but near the end of the chapter Bill talks about gravity storage pistons, which are simple but potentially huge ways to store power for use when the sun or wind are unavailable. Fascinating subject and the first I’ve seen about it. Really really good information. In chapter 18, Bill discusses how batteries are not the only means of storing power for off-hour consumption. Food like corn gets energy from the sun, and in turn can be fermented into ethanol, which can be drank or burned. Unfortunately, sun-to-corn-to-ethanol is not efficient (2% according to the author) so it isn’t a good standalone solution over fossil fuel. Sugar from sugarcane can also provide stored power – more than 2x what corn provides – and sugar can be fermented and produce alcohol too. Bill brings up catalytic converters also. I remember when they were introduced and how some opposed them as too expensive and not likely to help with pollution. As we know today, and as Bill points out, they made a big difference in reducing pollution and weren’t too expensive for their intended purpose. The same arguments many deniers and fossil fuel industry shills make today about reducing carbon dioxide output – and the deniers are as wrong today as they were in the 70s. I’m not a NASCAR fan. No problem with people that like it. Never developed a taste for it. Bill talks about NASCAR and how they use old auto tech to make races exciting, and (showing my age) I understood as I remember a time when cars had carburetors and pushrods. At least he didn’t bring up records yet (if you don’t know what they are, you are not old and you know how to use Google). Bill points our our inefficiency moving power as a great place to start to address global warming. The author mentions that trains are 4x more efficient than a truck – a neat tidbit of knowledge – so trains are better at movement than trucks. This chapter covers mass transit, pointing out that subways are far more efficient at movement than cars. The only unfortunate situation is that mass transit away from the New England area of the US (not including Chicago) usually relies on buses for mass transit, not trains or subways. I agree with Bill that riding public transportation lets passengers read or use their smart phones – something car drivers shouldn’t do while on the road (but, unfortunately, too often do while driving). One year I worked as a consultant for a client that had showers onsite for the employees, as they encouraged their people to bike to work to conserve gas and reduce pollution. I wish this was the stance of more companies. For a while, many companies allowed their people to telecommute, but that policy comes and goes over time, and it has been cut back the past two years in the technology field. Bill talks about the need for helmets when biking and I agree. I wear one when I bike outside, on a mountain bike or a road bike, and I wear a helmet when I ride a motorcycle. Being safe means more than looking cool to me. Biking is a great way to exercise, so any laws passed making it more convenient are ones I’ll always vote for – I hope you do too. This chapter covers automated cars. We’ve seen stories about self-driven cars the past few years, and Bill believes this will happen and become the major method of transportation within cities in the future. That would make Elon Musk happy. The idea of flying cars appealed to me, until I earned a pilot license. Ground school and CFIs proved that flying takes a lot more mental work than driving a car. Too many people mentally disengage while driving to talk, text, or play games – you can’t do that in a plane and survive long. Self-piloting planes (or helicopters, like Iron Man used in Captain America: Civil War) would be far safer. Navy ships and subs distill their own water while at sea, whereas cruise ships lack the power needed to distill water, so they use membranes to filter out particles from water. The author points out that this second method would work for cities needing water. This was what I thought, when I considered the recent droughts affecting California, and I suspect this type of solution will happen sooner rather than later. Mangroves are trees that can handle salty water – they filter out salt for useful water, and eject the salt on their leaves. The author points out that this is what we need to create – a system emulating mangroves. There is a material – graphene – that would work, but the cost of production and utilization could be a problem. With a growing population, this means even more climate change. And we waste too much food. Most of my neighbors don’t eat leftover food, so it goes in the trash. We had leftovers in my family when I was growing up, so I have no issue using leftover food for lunches. The author talks about using GMFs (Genetically Modified Foods) that need less food and water to grow more food, and GMFs have have fans and dis-tractors for many years, but eventually we will need to rely on them to feed our people. Bill looks for ways to use less energy in his own home. He uses solar power and talks about paying $10 every other month for an electricity bill. Now that is incredible. And he uses other systems to reduce power needs for lights and heating water. What is amazing is that he estimates he saves a tremendous amount of power usage for less than it costs for a nice SUV, and that savings is paid for in 10 years. If only more people did as much as Bill – maybe this will motivate more people to do the same. Bill talks about his eco-friendly competition with neighbor Ed Begley Jr., and this is the type of competition we need to see more often if we want to beat global warming. Striving for more efficient uses of power and resources can only help: us save money and the planet save resources and energy used to gather those resources. Bill had a reflector installed in his fireplace, which reflects more heat into the room. When I spent some time in a Scottish castle, it had one too, and the amount of heat that a few logs gave to the room was impressive. I sat back 20 feet from the fire and could still feel the warmth. This chapter covers solar power panels and the cost benefits. His solar cells generate more power than he needs, so that power is sold back to the power company and he receives the money instead of a bill. Bill’s solar panels are 15% efficient, but I found a company online that says it gets 22.1% efficiency from their solar cells, which is a nice improvement. The author uses solar power to heat water for his home, which is a cost saver. He also installed tankless water heaters, which I too have looked into, which instantly heat water and save money as there is no need to wait for running water to heat up. A good idea, and I plan to install solar heating and tankless water heaters in my next home for sure. The author had a garden installed and used a system with multiple zones and a rain sensor to improve efficiency. I had a sprinkler system with the same arrangement (zones and rain sensor) installed after I built my home, and saw a 40-50% decrease in water used (according to water bills) than when using regular mobile sprinklers. It helped to be able to time the sprinklers to work during the middle of the night, and to be able to control the amount of water sent to each zone. Finally, some numbers that intrigue me: space flight. The author shows why calculus is needed for rocket science: because burning fuel changes the weight of a space craft constantly. According to Bill, a 100% efficient rocket needs 500 million joules to life one ton of cargo to 62 miles (the beginning of space). To get into orbit, you need twice that amount of energy. To get into geosynchronous orbit (1 day for each time around the Earth), it takes 5000 million joules of energy. This energy does not count the rocket mass and fuel itself. Air pressure against a rocket decreases as altitude increases. Max-q is dangerous for the rocket as the pressure on the nose of the space craft is maximum. The location where a space craft is launched is important as well, since launching near or at the equator means the Earth’s rotation will add to a craft’s orbital velocity. Returning to Earth means getting rid of the energy used to get into orbit. When in low Earth orbit (like the ISS), one ton of payload must dissipate 30 billion joules of energy, and the easiest way to do that is use the friction of the atmosphere to convert energy into heat (the reason for good heat shields on space craft). There. Bill provides the information you need to plan how much fuel you need to get your own space craft to space and back again. The author states that most rockets use rocket fuel called RP-1 (Rocket Propellant #1), which is refined kerosene with chains of carbon atoms. All particulates are removed (which explains why the first launch in ‘The Astronaut Farmer’ failed so badly). Liquid hydrogen (used in Apollo and the space shuttle) contains more energy than RP-1. A nice surprise in this chapter is the simple yet clear explanation of ion propulsion (xenon gas atoms propelled by electrical grid out of the craft, pushing it forward as the xenon leaves the craft. Since ion engines develop slow but constant power, they currently can only be used once in space, so you still need RP-1 to get to space. Bill also talks about solar sail power. NASA launched their own NanoSail-D into orbit in 2011. The Planetary Society successfully launched LightSail in 2015, and they intend the next generation of this to launch in 2018. The takeoff weight for airplanes is around 10% fuel, while the takeoff weight for space craft is 90%. Lighter materials affect both airplanes and space craft, and would lower takeoff fuel requirements. DO HUMANS HAVE A DESTINY IN SPACE? As global warming is a modern threat, just as dangerous as ISIS and other terrorists, our generation needs to solve the global warming threat to our planet. That would make the world a better place – for us and for our children and grandchildren. We also need to explore space to learn more about life here and out there. A carbon fee or carbon tax will work, if conservatives stop opposing it. This is the best way to tie economic considerations into carbon emissions, and it could be our best hope to reduce greenhouse gases. The issues and optional ways to address them are well covered in this book. Reasonable people being logical should have no issue with Bill’s suggestions, unless they have a special interest agenda that provides economic incentive to ignore the dangers of global warming. That incentive means that some of our politicians and policy makers put the interest of the fossil fuel industry ahead of their own families, friends and fellow countrymen. Is money worth more that human life? It shouldn’t be, but unfortunately it is. Global warming is real. Doesn’t matter your political or religious affiliation, facts are facts. Radio and internet personalities, political scientists, and people drawing paychecks from think tanks paid by companies promoting fossil fuel use do not know better than people with advanced degrees in science. If that bothers you, you are being unreasonable and are fooling yourself. I’ve seen vicious attacks on climate scientists by trolls on Twitter, whose arguments were worthless but these trolls were blinded by hate and refused to be reasonable and refused to accept that uneducated people cannot know as much about a subject as subject matter experts with advanced education on climate science. Why trolls with no or little hight school education feel like they can challenge these people on climate science is beyond me. Either we fight this battle now, or allow our children and grandchildren to face much greater (and potentially unbeatable) challenges that we do at this time. This book is well written, flows well and breaks down technical items enough for anyone (except senators on the payroll of fossil fuel companies) to understand the danger of global warming and the technical difficulties we must overcome to make changes to reduce our carbon output. This book educates and informs people that really want an education on climate science. Deniers should read it as it disproves denier excuses intended to delay our fight against global warming. I can’t see how an honest denier could read this book and still fail to understand the dangers of global warming. I’d think even someone with an advanced degree in political science would understand the science explained in this book, clearly enough to realize they are hurting, not helping humanity. I give it 5 stars out of 5 and recommend purchasing it. Students and adults will learn a lot about science, and it is not partisan. It is real, it is true, and it must be a wake up call to people trying to harm our world by fighting the fact that global warming is the biggest danger to our species right now.